York Music Therapy offers individual sessions that are either 30 minute, 45 minute, or 60 minutes in length. The length and frequency of sessions is established after an initial consultation and an assessment. Group sessions allow clients to participate in music therapy with their peers, giving them the opportunity to work on social skills and build friendships in a supportive environment. General music therapy groups address a wide rage of goals while still targeting the specific needs of each client. Groups are formed and their lengths are determined based on the age and ability of the clients. In this group, participants will have the opportunity to develop and practice social, conversational, and interpersonal skills through specially designed music experiences. Techniques such as song writing, cooperative instrument play, and role-playing will be used to acquire skills that promote positive social interactions and interpersonal connection. This group is great for developing not only social, but behavioral and communication skills as well. Practicing these skills with others who have the same needs simulates real life interactions, and fosters empathy and friendship. You don't have to be a virtuoso to love to sing and play! 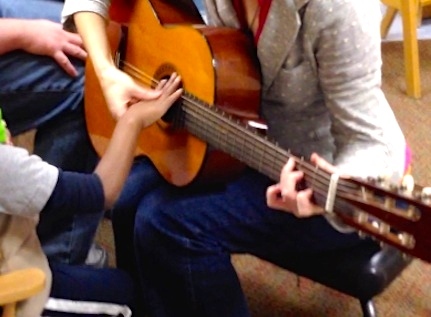 York Music Therapy offers adaptive music lessons to meet students at their level, and work with them to develop their musical abilities. Working from a therapeutic framework allows us to create a learning environment that is supportive and accepting of all skill levels, while still providing enough of a challenge to make success rewarding!